These needle nose pliers are for use on R/C, static model products and more. Their long, slimline jaws provide superb grip. 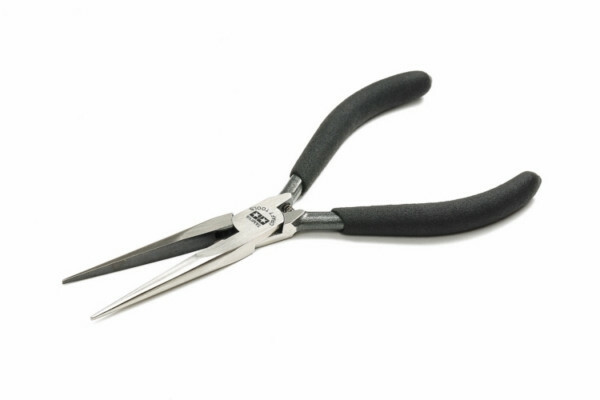 The pliers can be used as one would tweezers, and are also suitable for bending and cutting materials such as brass wire. • Jaws are chromium-vanadium steel. Their slimline form makes them ideal for work in confined spaces and with delicate components. • Handles have a comfortable and safe non-slip PVC grip. • Features the twin star logo on the hinge joint. • Edges inside the hinge can be used to cut mild steel wire up to 1.2mm diameter and brass wire up to 1.3mm.